Isn’t it fun how names develop for tea blends? The naming process is almost as much fun as the blending process itself. For weeks, I had been trying to come up with a tea that invoked the taste of the creamsicles I used to enjoy so much as a kid (Who am I kidding? I still enjoy them!). Frozen orange over a vanilla bar. Yum! My initial attempts were based on black teas, and the flavor of the tea kept overwhelming the flavor of the orange and vanilla. Finally, I hit on something that seemed to work. A blend of rooibos and honeybush as a base, which adds a rich, creamy texture. Orange and natural vanilla for the cremesicle flavor, and just a touch of carob to round everything out. I tried it both hot and iced and decided I liked it. Some friends, Al and Ranetta, popped by the tea bar, and I asked if they’d like to sample my newest concoction. Being willing guinea pigs, they acquiesced. They tasted, we talked, and they liked it. Ranetta asked if she could buy a few ounces. As I started to write out the label, my hand stopped, poised to write, as I realized I hadn’t named the new blend yet. I decided to write “orange creamsicle,” but Al was talking and distracting me (It’s all Al’s fault. Really it is). I misspelled the word. Unbelievable, isn’t it? But I threw an extra K in there. I noticed the error and commented on it. “How did you spell it?” Al asked. It struck us both at about the same time that this is a red tea (the rooibos plant is also called the African redbush), so that could end up as a very fitting name. Al asked for a sheet of paper and set to work sketching a logo. I scanned, tweaked, and colorized his masterpiece (sorry, Al) and included it at the top of this blog post. 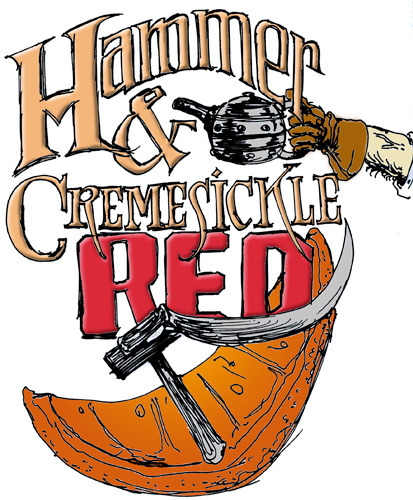 You must buy Hammer & Creamsickle Red now, comrade. Will take you back to childhood summers at family dacha on Volga river. Decadent treat from American capitalists. We have our own capitalism now; our own pravda. We have no money, but tea is cheap. Try now. Posted on 18 October 2011, in Styles & Blends and tagged blends, hammer & cremesickle, honeybush, logos, red tea, rooibos, tea. Bookmark the permalink. Leave a comment.